CarGurus has 846 nationwide FX35 listings starting at $2,995. Edgy styling and (mostly) sprightly performance help make the 2011 Infiniti FX35 a credible alternative to more expensive European sport crossovers. Though a Porsche Cayenne will impress status-seeking neighbors and enthusiast drivers alike, its absurdly high price makes ownership a privilege reserved for the very few. Enter the 2011 FX35, a sporty luxury SUV with a boutique feel and a Wal-Mart price. The 2011 Infiniti FX35's defining characteristic is undoubtedly its pudgy, avant-garde styling. Amplifying the image introduced with the original FX, the second-generation model's squat profile and pug-nosed grille is sure to elicit responses, both positive and negative, from passersby. Though the look is far more adventurous than the ubiquitous Lexus RX or the sharp but boring Acura MDX, the 2011 FX suffers from an overall lack of design cohesion, as well as a cargo-space deficit. Based on the same underpinnings as the company's G series sedan and coupe, the Infiniti FX35 mostly lives up to its billing as the sportiest of crossovers. While the ride is rather harsh and unforgiving, especially with the optional 20-inch wheels, the 2011 FX35 corners with much more poise than the average SUV. A double-wishbone front suspension and lively, speed-sensitive power steering promote enthusiastic driving, though the FX35's considerable bulk hinders quickness in cornering transitions and contributes to body roll. Power for the 2011 FX35 comes from Infiniti's punchy 3.5-liter V6. With 303 hp and 262 lb-ft of torque on tap, the all-aluminum V6 hustles the two-ton FX35 from 0-60 in an impressive 6.1 seconds. While the engine isn't as refined as the velvety-smooth mills from Acura and Lexus, its throaty exhaust note and free-revving nature are consistent with the FX's positioning as the drivers SUV. Fuel economy isn't exactly a strong suit, with the FX35 returning only 16 mpg in the city. For 2011 Infiniti offers the FX35 in both front-wheel- and all-wheel-drive trim. Both versions receive the company's excellent seven-speed automatic gearbox. The quick-thinking transmission serves up smooth, timely shifts and features well-matched ratios. All-wheel-drive FX35s feature Infiniti's intelligent AWD system with a snow mode that aims to improve traction in wintry conditions. While Infiniti doesn't recommend hauling trailers with front-drive FXs, the FX35 AWD is rated up to a nominal 2,000-pound towing capacity. Intimate and cocoon-like, the 2011 FX35's cabin will impress drivers and passengers with its luxury and technology, if not with its spaciousness. Though the sloping roof and high beltline limit both visibility and cargo volume, the cozy space reinforces the FX35's performance image. The high dash is rendered in high-quality soft-touch plastic and wood, and all controls are easily within reach. While the ergonomics and control relationship are good, due in no small part to the fully adjustable steering wheel, the menu-driven central display and radio system isn't particularly intuitive. In keeping with Infiniti tradition, the interior is decorated with a small analog clock. Seats are firmly bolstered, supportive and upholstered in soft leather, with quilted hides available as an option. Standard push-button keyless start is a nice touch, as is the included rear-view camera system. All 2011 FX35s get an excellent Bose stereo system with 300 watts of power and a hard drive for digital music storage. The FX35 can also count xenon lights, a power liftgate and dual-zone automatic climate control among its standard features. Navigation, adaptive cruise control and a technology package that includes rain-sensing wipers are available as options. Infiniti offers a host of innovative new safety features in the 2011 FX35. In addition to the usual front, side and curtain airbags, the FX35 features front seat active head restraints and electronic brakeforce distribution. Optional Integrated Brake Assist pairs with a Forward Collision Warning system to prevent rear-end accidents by slowing the FX35 automatically if it's closing too fast on a stopped vehicle. The 2011 Infiniti FX35 hasn't been tested by the NHTSA for crash-worthiness. Considering the FX35's handling prowess and strong value quotient, it's a surprise that Infiniti moves only a few thousand copies each year. Given that the concept works (the first-generation FX was a strong seller), the 2011 FX35's attention-getting yet polarizing styling clearly isn't doing it any favors. While some might find it nice to have something that looks unlike anything on the road, the majority of the car-buying public is apparently willing to accept only a certain degree of quirkiness in their sporty crossovers. What's your take on the 2011 INFINITI FX35? Gil 'For 2011 Infiniti offers the FX35 in both front-wheel- and all-wheel-drive trim." The FX, 1st or 2nd generation, was never offered in FWD trim. Zflyer Come on Jesse, the FX35 comes standard with REAR WHEEL DRIVE not front wheel drive as stated in your review. A major error like this makes the entire review suspect. Bormann_007 Wanl-Mart price? How is a $60,000 car considered cheap? 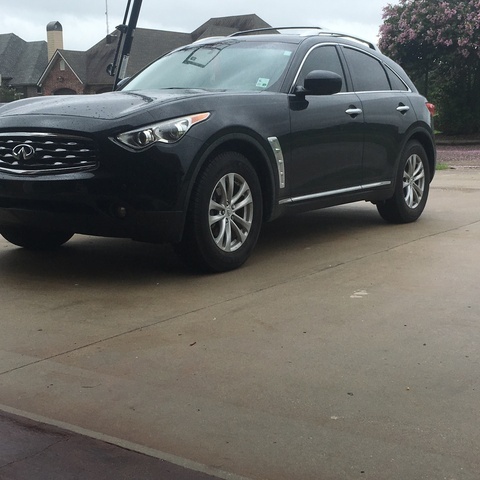 Have you driven a 2011 INFINITI FX35? Where Is Remote Keyless Entry Module On Infinity FX35? Monthly installments should come with explanation.